Rodriguez particularly liked the 8-Pack's numbered witness holes and the magazine's slick finish. There is no shortage of 1911 magazine manufacturers. But there is a shortage of quality magazines. Ed Brown's magazines are among the best but, sadly, Ed offered only seven-round magazines until last year. His new eight-round, 8-Pack magazine was worth the wait. The 8-Pack is built on a heat-treated, stainless steel body. 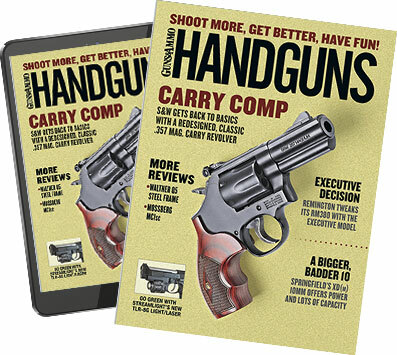 The body has been slightly lengthened to accommodate the eighth round, though the magazine looks shorter thanks to a tough polymer base pad that wraps around the magazine tube. The pad slides off with the push of a button to facilitate disassembly for cleaning. Like all Ed Brown magazines, the 8-Pack features a heavy-duty spring and a rounded, steel follower. The magazine body has a slick proprietary finish to facilitate faster reloads. It also repels dirt and powder. Witness holes are laser-engraved with the numbers 2 through 8 on both sides so you can see how many rounds are left in the magazine. The base plate is also numbered with a digital, scoreboard-style 88. By filling in the appropriate "slots" on the eights with colored paint, you can number your magazines from 0 to 99. I left my sample magazine in my range bag for the last four months. I used it in a variety of 1911s and ran about 350 rounds through it. I never cleaned it once, nor did I baby it, yet the 8-Pack never failed to feed or lock back the slide. I ejected it onto the pavement many times during my training sessions without issue, even though the magazine was often partially loaded. A test of one magazine is hardly scientific, but quality of the 8-Pack's components was so good that I feel comfortable recommending it.